From commercial iced tea brewers to straws, our cold beverage supplies include everything you need to make and serve refreshing drinks. 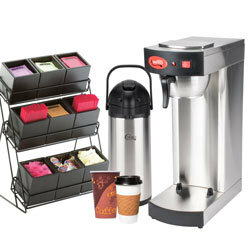 We have all the hot beverage supplies needed to brew, hold, and serve coffee, tea, cocoa, and other hot drinks. Browse our brewers, airpots, and cups. 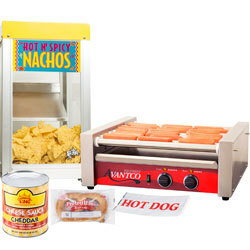 Prepare and hold hot dogs, nachos, and more with our snack station supplies. These warmers, merchandisers, and cooking units are perfect for counters. 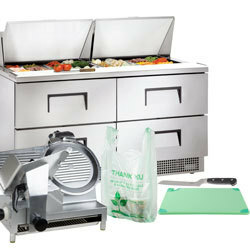 If you want to make sandwiches, salads, and other meals to-order, browse our deli counter supplies, including cutting boards and meat slicers. By setting out these organizers, bins, and other grab ‘n go supplies, customers can easily access condiments, plastic cutlery, napkins, and more. 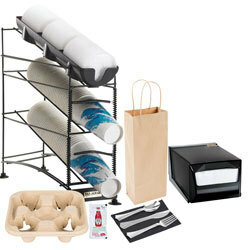 Our merchandising and display supplies will help you increase impulse sales of pre-made foods. Browse our bakery cases, soup kettles, and more. 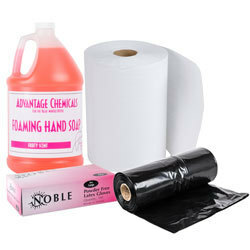 Keep your establishment clean and safe with these facility safety and maintenance supplies. 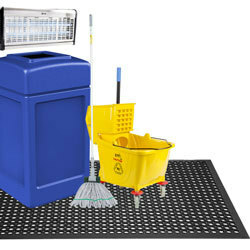 We offer everything from trash cans to wet floor signs. We carry all the janitorial disposables and supplies your customers expect from your business, including soap, paper towels, and even hand dryers. By stocking up on our convenience store supplies, you’ll be able to make and sell hot foods, serve chilled drinks, and offer take-out snacks! You’ll find all the best to-go containers, napkins, flatware, beverageware, and other convenience store supplies, as well, to get your customers in and out the door! And, by offering fresh food and refreshing drinks to your customers, you can help boost your establishment’s impulse sales, since patrons will be enticed to buy something while they’re filling up on gas or shopping for other items. If you’re looking for more great products to help your day-to-day food prep tasks go more smoothly, be sure to check out our sauces, salsa, and marinades. You may also want to stock up on condiments and portion cups and lids. If you're wondering where to buy convenience store supplies, we have a large selection of convenience store supplies for sale at the lowest prices. Whether you're selling ice cream sandwiches, pre-made sandwiches, ice cold bottled drinks, or slices of your fresh baked cakes and pies, chances are that you'll need some sort of refrigerated merchandiser to keep your goods at the proper temperature! 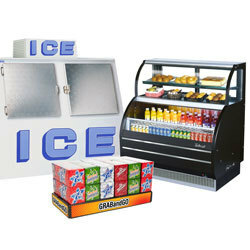 Refrigerated merchandisers and freezer merchandisers share many similar components with other commercial refrigeration products. This guide will show you some of the similarities and differences between types of merchandisers and commercial refrigerators , and also help you select the right type of merchandiser for whatever it is you're trying to sell! Flavorful, hot beverages are a cornerstone of the restaurant industry. From quaint street-side coffee shops to chain restaurants and even bars, everyone needs a fresh java or tea at one point (or several) throughout the day. By following this buying guide, you can find the best hot beverage equipment to make sure your business is serving the drinks that'll turn one-time customers into regulars. 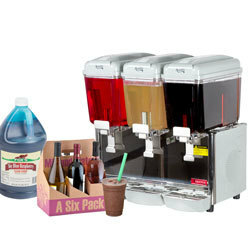 You’ll find a range of beverage dispensers, coffee brewers, slushy machines, and refrigerated dispensers among our c-store supplies that allow you to offer your customers a variety of hot and cold drinks. We also carry plastic and foam take-out cups, lids, and other disposable necessities, so customers can grab their purchases and go. Don’t forget to set out bins and condiment organizers to keep countertops and self-serve stations neat and orderly. Our selection of convenience store equipment includes cooking, holding, and warming units that allow you to make, hold, and serve various snack foods like hot dogs, soft pretzels, pizzas, and more. These options include merchandising stands that will help increase impulse sales. You can also check out our prep stations, refrigerated cases, and bakery displays, so you can sell made-to-order sandwiches, salads, and desserts. Don’t forget that our janitorial and maintenance products, restroom essentials, and personal hygiene items are also necessary to have on-hand. These convenience store supplies will help you maintain a clean and sanitary business that will make your customers feel welcomed. You’ll find toilet paper, dispensers, and deodorizers to use in bathrooms, as well as replacement light bulbs that will keep your convenience store equipment operating at full potential.